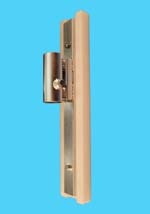 Dock Accessories | Dock Bumper Mounts, Bumpers & Brackets | VE-VE Inc.
D-540; Adjustable "Bumper Bracket" ( For 1-1/4" pipe. ( 1-5/8" O.D. )). 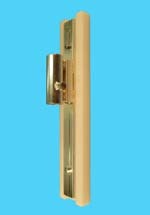 Adjustable "Bumper Bracket" to attach YOUR OWN piece of wood and tack on some carpet for one of the most economical boat bumpers. ( 1/2" adjustment bolt included ). NOTE: Shown with carpeted wood bumper that DOES NOT come with Bracket. D-545; Adjustable "Bumper Bracket" ( For 1-1/2” pipe. ( 1-7/8" O.D. )). 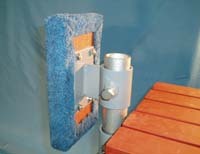 Adjustable "Bumper Bracket" to attach YOUR OWN piece of wood & carpet for one of the most economical boat bumpers. ( 1/2" adjustment bolt included ). D-541; 2' "Bumper Mount" ( For 1-1/4” pipe. ( 1-5/8" O.D. )). 2' "Bumper Mounts" are made to slip over the top of your existing ( 1-1/4" ) dock posts and mount a Carpeted Wood or Polyethylene Bumper. D-546; 2’ "Bumper Mount" ( For 1-1/2” pipe. ( 1-7/8" O.D. )). 2' "Bumper Mounts" are made to slip over the top of your existing ( 1-1/2" ) dock posts and mount a Carpeted Wood or Polyethylene Bumper.